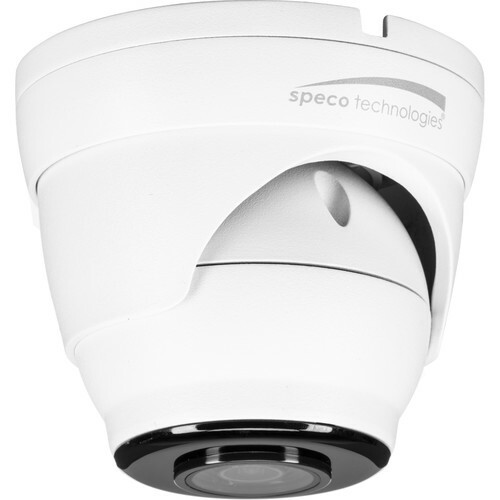 The O5K1 5MP Outdoor Network Turret Camera from Speco Technologies uses a 1/2.7" CMOS sensor and a 2.8mm fixed lens to capture 2592 x 1944 resolution video. IR LEDs provide up to 100' of night vision. H.265 and H.264 video compressions manage file size while maintaining the best possible video quality. Integrated PoE technology simplifies connectivity by enabling the transfer of power and data through a single cable. This camera is housed in an IP66-rated enclosure that is suitable for outdoor use. It is designed to be used only with Speco Technologies' ZIPK4T2 and ZIPK8T2 NVRs. Box Dimensions (LxWxH) 5.8 x 5.4 x 4.85"